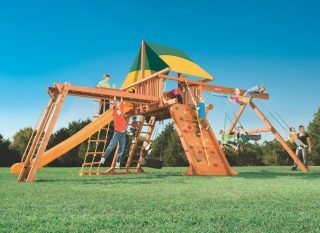 LARGE LUMBER – Outback XL 7′ playset includes a 36 sq. ft. fort, vinyl roof, three-chain tire swing, dual ladder, rock wall, rope rung ladder, 14′ Super slide, single accessory arm, and accessories. 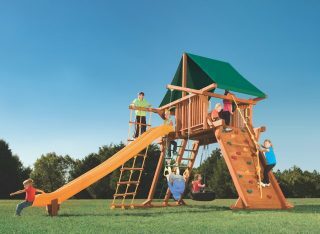 LARGE LUMBER – Outback XL 7′ playset includes a 36 sq. ft. fort, vinyl roof, three-chain tire swing, dual ladder, rock wall, rope rung ladder, 14′ Super slide, monkey climber, four-position swing beam, and accessories.